NJC(Not Just Cleaning) specialises in providing commercial cleaning and support services including window cleaning, rope access, specialist cleaning, public realm cleaning, waste management and janitorial to mainly blue-chip clients. The company recently made the bold decision to relocate its head office to Central London, retaining a regional support facility in Wokingham, Berkshire. 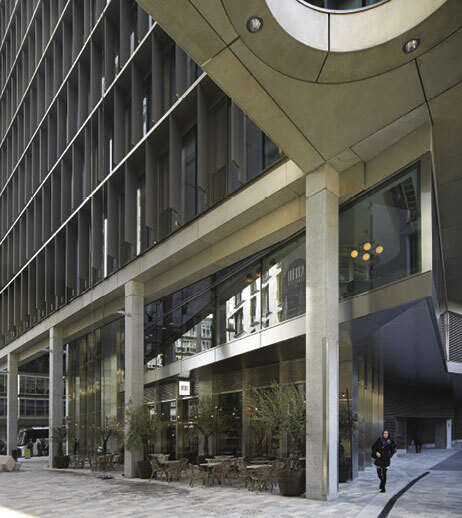 It’s unusual to hear about any organisation heading into the capital, and even more surprising to find a service company take up residence in such a glamorous location as the Zig Zag building. The development, which is part of Landsec’s £2 billion transformation of London’s Victoria, opened in 2015, and went on to win the best office building at the World Architecture Festival 2016. We sat down with MD Paul Crilly to ask, what prompted such a move when the majority of service suppliers tend to opt for out-of-town locations such as business parks? The impetus, he says, was deciding to take advantage of building lease breaks to completely rethink its plans. “We had a desire to do something quite different, and once we started on that journey we had a perfect storm of opportunity. Our space in London was pretty basic, and not the best environment for colleagues. The lease in Winnersh was up for renewal, and with 80 per cent of our revenue coming from Greater London customers, we decided there was a compelling reason to be in London, as close as possible to many of our key customers. 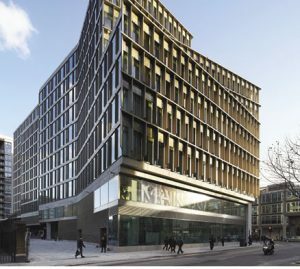 Landsec is one of NJC’s regular customers, which presented the opportunity to work with the property firm in choosing the new office (on the first floor of the 12-floor Zig Zag building). Landsec also took care of project managing the Cat A and B fit-outs for the new office space. For NJC this meant that aside from design meetings to discuss colour palettes, furniture ideas and so on, they could concentrate on preparing for the head office move in February 2019. Says Crilly: “When you look at office trends at the moment, the likes of WeWork are disrupting the industry and their environments all look and feel like this, so first and foremost we’re trying to reflect the market we work in. The move means that we now look like the customers we’re servicing, as these exposed ceilings and concrete walls are typical of the sort of offices we deal with in our marketplace. The new offices feature a range of flexible meeting rooms which can be formatted as one larger space for team training or town hall meetings. 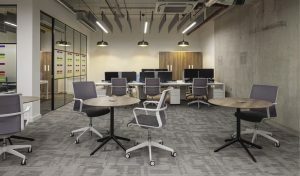 One of the most popular additions has been a sit-up counter in the centre of the office aimed at flexible workers, which has already attracted operational colleagues into the offices to make use of the space. 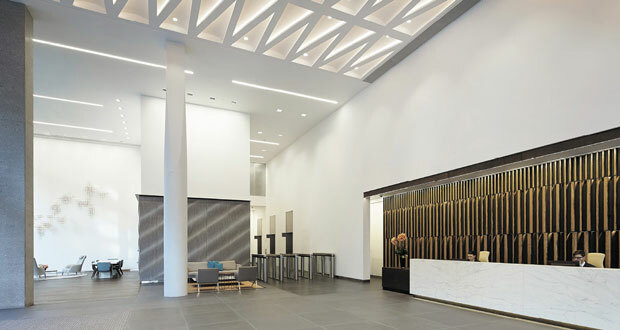 One of the big selling points of the Zig Zag building is its intelligent design, as it offers a range of smart technology that gives precise control over environmental aspects such as lighting, heating and cooling. From a soft services perspective digitisation has been seen within the FM sector as an essential mode of innovation, but Crilly is quick to deny the adoption of new tech for the wrong reasons. “People look at technology as if there’s a problem to be solved, and I’d rather look at what your customer needs and start from a base position,” he explains. “For me, transparency and integrity are everything, so I need to find a way to agree a sum of hours for services. I’ll achieve that as seamlessly as possible through time and attendance technology, where I can demonstrate that we have met the hours agreed, and then through a quality auditing regime I can also tell you the quality of those hours. This kind of technology, he argues, can help raise the bar in terms of performance, health and safety and compliance. For example, you might use an automatic measurement to monitor the number of near misses being recorded, and if the number of near misses starts to change the system might recommend carrying out a toolbox talk on health and safety. Data monitoring may be achieved in a number of different ways; for example, Crilly says he expects footfall sensors to become a standard washroom requirement. Another key driver for locating the firm’s HQ in London is the fact that the capital is becoming a vertical city, with around 200 towers currently in planning. This will require services to get smarter as buildings go higher. NJC has accordingly developed its in-house capability in window cleaning, building maintenance and inspection from the ground, mobile elevated work platforms, cradles and rope access window cleaning.